Of course the world is big enough to occupy over 6 billion people, everyone has his or her talent. The word 'farm'and 'plant' in this context means that the world is big enough for everyone to explore and make a difference. God has blessed each and everyone of us with talents and He expects us to impact it in others, whether is through singing, writing, teaching and many others. It won't be nice if you do not make use of your talent positively. Discovering your talent is one thing and impacting the world with it positively is another thing. 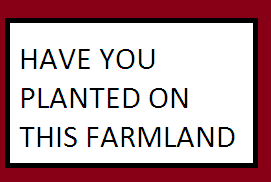 So ensure you plant something good on this farmland (the World).